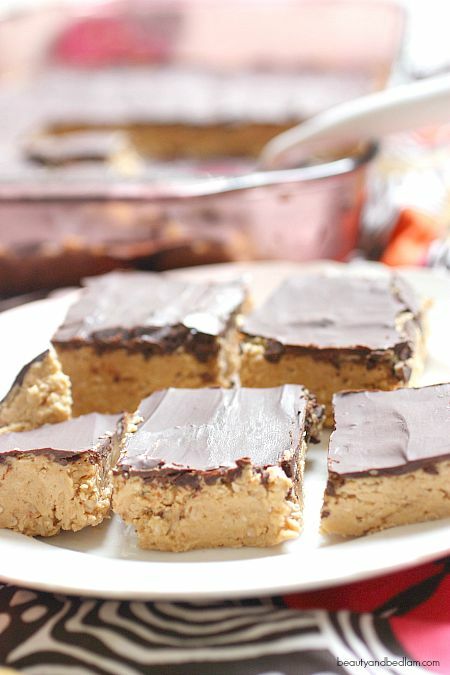 Today I’m sharing about the combination of which I can’t get enough: Peanut butter and chocolate in the goodness of No Bake Buckeye Bars. When the guy holding his chocolate bar stumbled into the girl with her peanut butter, a match was made in heaven. I’m pretty sure we can all agree that the stars aligned. The culinary world as we know it was never the same again, and I’m sure you can sympathize with me on the sentiment that no one can mix enough chocolate and peanut butter together. It’s an addicting combo which I adore. 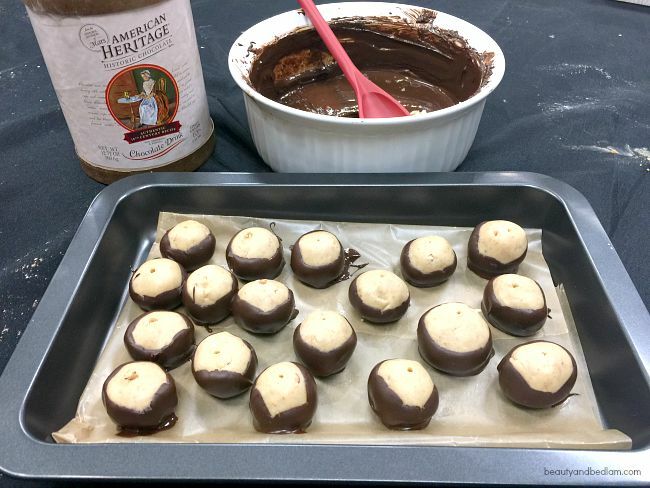 During the holidays, not a festivity goes by when someone doesn’t bring their infamous take on the Buckeye Balls. They’re a bit different from my Peanut Butter Balls because they’re more of a dense fudge consistency, but both are equally delicious in their own way. 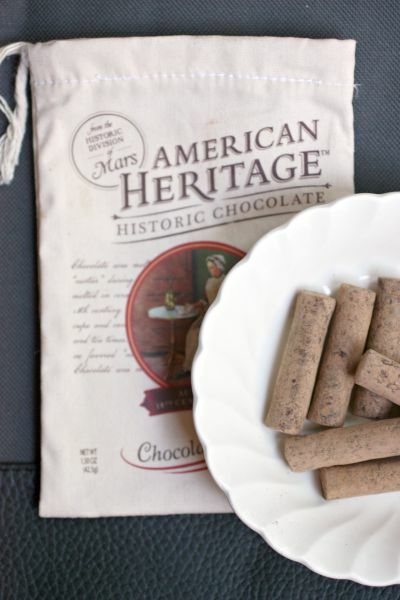 When we visited Washington DC with American Heritage Chocolate, we had a blast whipping these up in the conference room of the National Archives. Yes, I am fairly certain they mentioned that’s never been done before, but I know that good ole George Washington would have approved. My daughters accompanied me and we had a blast (see them cooking?). Considering how much dough we were snitching while mixing, the idea agreed with them. Learning about the historical aspects of chocolate over the last year with American Heritage Chocolate has been fascinating. It’s been woven into the fabric of American culture for centuries. It is more than just our favorite treat. It reflects different groups of people, cultures and even historical events throughout the ages and Mars Chocolate undertook an extensive global research initiative to uncover the true history of chocolate. 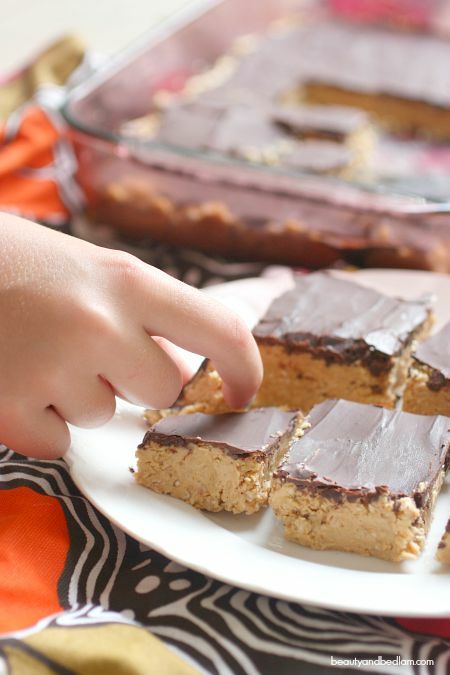 So onto our NO Bake Buckeye Bars. I’m going to admit something. I went off a no sugar, no carb detox to taste test these for you. Someone had to take one for the team and I felt it was my obligation. Due to the fact that I am “trying” to be a bit more sensitive to fat grams, I decided to try and cut the butter and sugar amounts and add in oatmeal to stretch the batter a bit. Oh my, you can’t even taste the oatmeal in it, but who are we trying to kid, it just means you can eat a double the amount. I played around with the amounts quite a bit and did a much healthier version using all natural peanut butter and lower amount of sugar. The consistency is a bit different, but the flavors are still fabulous. I’m not posting that yet because I realize any combination of this recipe can not be messed up. When you mix chocolate and peanut butter, nothing can go wrong, so as you make this recipe your own, just start playing with the measurements to get the taste you love. Since American Heritage Chocolate has 9 spices added into their historic blend, the depth of flavor is just wonderful. I had everyone taste test the variations I made and it was a split decision. Some liked more peanut butter, more oatmeal, less sugar and some liked more sugar, less peanut butter. It’s preference, but regardless, these are rich, so cut them in small squares. It’s so hard to wait for them to set up in the fridge. That’s why we always dig in and pop a few balls of dough in our mouths first. (Just to make sure we don’t want to add a bit more peanut butter or sugar. :)) If you feel the oatmeal adds an odd texture, don’t worry, once it sits, you can’t even tell it’s in there. Be prepared for a party! BEDLAM MOMENT ALERT: You can scroll to the recipe or hear about my Bedlam moment that happened on Saturday. 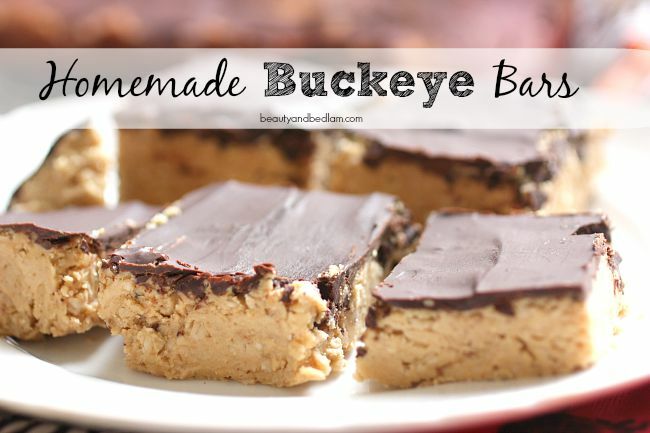 I made an extra large batch of these Buckeye Bars so I could bring some to our college football playing son. Their team played Virginia Tech on Saturday and I knew he had a long bus ride home after the game and he could share these with his buds. When I went through the “family guest” gate, I assumed they would let me bring in my Tupperware to hand him after the game. The guy said “No” and they had to be thrown out. I was DESPERATE!! These pieces of gold can NOT go in the garbage can, so I asked him if I could hide them right where he was standing behind the big bin and I’d come get then after the game. He agreed. So after the game, I went to get them and there on the top of the garbage is my Tupperware and ALL THE BARS HAD BEEN EATEN!! I am sure it was those guys because they can tell chocolate gold when they see it. Only crumbs were left. I was a sad, sad momma, but at least they didn’t go to waste. So yes, they are that good that strangers can’t even stay away. Now go make these and you’ll see why. Summary: These Easy No Bake Buckeye Bars take the taste of our favorite peanut butter balls and make them easier. Beat or mix softened butter, peanut butter and vanilla until well blended. Add oatmeal; mix well. If doing by hand, double check that you mix all ingredients in bottom of bowl. Press onto bottom of pan. 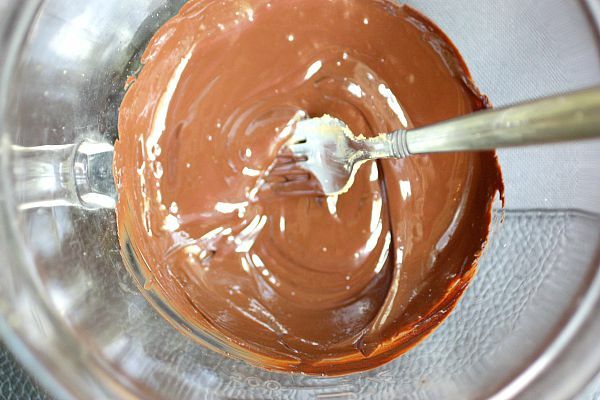 Melt American Heritage Chocolate (or chocolate chips) in microwave or in a double boiler over hot water and spread over peanut butter mixture. Refrigerate. These must chill for minimum of 30 minutes before cutting and even up to two hours. 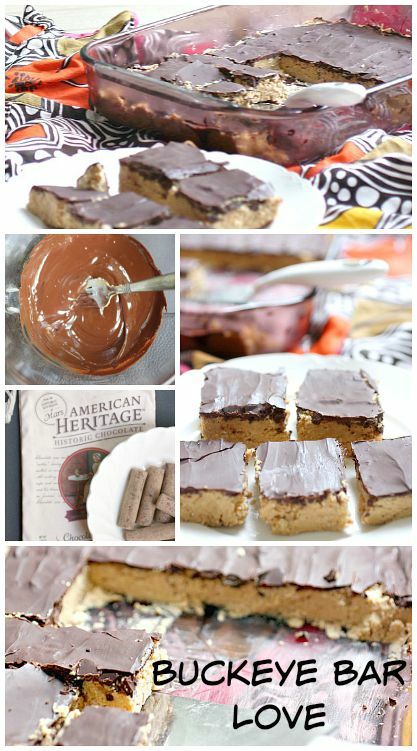 Disclosure: Thank you to American Heritage Chocolate for partnering with me on this post. It’s truly an honor to share the history of chocolate and all that Mars is doing to make this a reality. All opinions are mine. I read to third graders and a special combined class every Wednesday. I usually bake for the children on Tuesday but I am not allowed to bring ANYTHING with nuts. Any suggestions for something to use instead of peanut butter? Hmm – that’s a tricky one to keep the recipe this simple as a no bake treat because you need something sticky to make it bind together. I’ll try and think of something to substitute but nothing is coming to the top of my head. Is it any nuts or just peanuts? Would almond butter work? I’m thinking it’s probably all nuts. Yes ALL nuts. It seems almost recipe I find has nuts in it. I would appreciate any help you can give me. Oh my goodness. This is too funny. We are big Hokie fans. I’m class of 75. We were tailgating in the lot closest to the coliseum. I would have held on to your cookies for you until after the game. But how funny that someone ate them but saved your dish? I’m surprised they didn’t get rid of the evidence. oh fun!! You were there? Yes, I definitely would have given you my pan!!! haha That sure is a fun place to tailgate. I forgot to tell you that my dad sits in a handicapped seating section. Despite the rule about no food allowed in, he takes a bag with candy bars to give all the ushers. They call him the “candy man”. In regards to your diet, have you heard about Trim Healthy Mama? It’s a wonderful diet and you can have your BUTTER!! Oh my gosh my grandma used to make these and I had forgotten about them. I must make these today,thank you! Thanks for making these a bit healthier! Now I can eat the whole pan 😉 LOVE these!